Clarke County was organized officially on December 23, 1833, and named in honor Mississippi’s first Chancellor, Joshua G. Clarke. Consisting of some 692 square miles, Clarke County has a 2,000 census population of 17,955. The county includes the towns of Enterprise, Quitman, Shubuta, Stonewall, and the village of Pachuta, as well as a number of closely knit communities throughout the county, which have very distinct personalities and histories, with a real spirit of volunteerism and sense of pride in being good neighbors and good citizens. The county operates with a Board of Supervisors and the towns with a Mayor and Board of Aldermen. W.A. and Laura L. Ward moved to Clarke County in 1846 from the Kershaw District of South Carolina (Camden). They settled north of Enterprise on an 800-acre tract on the Chunky River and lived in a log cabin until their home was built. W.A. Ward became a very successful planter who was almost hanged for his money by Gen. William T. Sherman’s troops when they invaded Enterprise. The soldiers were after $1,800 in gold Ward had received for the sale of cotton shipped down the Chickasawhay River to Mobile, Alabama, sometime before the Enterprise invasion. The Ward House is historically significant for its Civil War associations and the contributions made by the Ward family to the economic and social development of Enterprise. The house and land have been owned continuously by the Wards for more than 125 years. The architectural significance is attributed to the house being one of two antebellum “coastal cottages” in the county, a vernancular type house with a double pitched roof. River Road Stonewall County Road 320. Southern fried catfish, seafood, and steaks. Some 815 acres of rolling woodlands and a 65-acre fresh water lake. 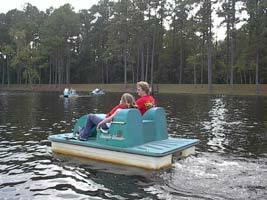 Vacation cabins, camping, tennis courts, picnic areas, nature trails, paddleboats, fishing, and a visitors’ center. (601) 776-6651. Located east of Quitman just off County Road 511 on County Road 6752. Turn left from County Road 511 on to County Road 675. Take first unpaved road to the right (County Road 6752). Church is approximately one mile on the left. Quaint little country church with family cemetery. Circa 1855-1857 • Greek Revival • Located at the end of County Road 1222, southwest of Quitman. The McGowan-Fatherree plantation was built by the McGowan brothers, originally from Georgia, and was located on the old stagecoach road. The McGowan family became the leading family in the immediate vicinity, and their plantation was a gathering place for political, social, and religious functions. Hamilton and Elbert McGowan were twins. Along with their younger brother Robert, they helped construct McGowan’s Chapel, the first Methodist Church in the area. The plantation was entirely self-sufficient. Cotton, corn, vegetable crops, and melons were cultivated. A cotton gin was operated on the place and ginned cotton for the neighbors. There was also a gristmill, sawmill, and molasses mill located on the original homestead. Circa 1857 • County Road 120 just off Highway 18 West in the Harmony Community. The first Methodist church built in the area. Two miles south of Quitman on Highway 145. Memorial to confederate soldiers who died at Texas Field Hospital. 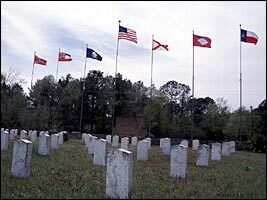 Flags identify home states of soldiers buried at cemetery. Soldiers wounded at battles of Iuka, Corinth, and Shiloh. Circa 1859 • Greek Revival vernacular • 175 County Road 253, north of Shubuta on Highway 145. This house was built by Jacob Sumrall, a railroad man living in the area after the arrival of the Mobile & Ohio Railroad in 1855. His family is said to have lived in boxcars until this house was completed. The site became a community center and was known as “Sumrall Switch” because the train would stop here to offload groceries distributed from a store behind the house. The Sumralls had a brick kiln and ground their own feed. Their place is said to be the site of the first church and school in this vicinity. Circa 1855 • Greek Revival • Langsdale County Road 610, east of Shubuta in the Langsdale Community. This is the most outstanding and remarkable house in Clarke County and is in a good state of preservation. This land was originally owned by Thomas P. Falconer, an early resident of Wayne County. It came into the Lang family in 1846. Clement D. Lang, a wealthy bachelor son of the original Lang owner, W.A. Lang, began construction of the house and plantation after 1853. It is said that 12 carpenters and all available slave labor were required to build the house, which took 14 months to construct at a cost of $35,000. Lang owned several thousand acres of land and 500 slaves. Cotton was the principal money crop. It was shipped down the Chickasawhay River to Mobile on flat boats. During this time, Langsdale was a social and cultural center for the surrounding countryside. Clement Lang was ruined by the Civil War and died destitute. Other buildings of interest at Prairie Palace include two sets of out-buildings (circa 1855). One is the only remaining set of out-buildings in the county associated with this type of plantation. The other is the only remaining slave quarters on this plantation. Two rows of brick buildings, 10 or 12 originally, were built on each side of a wide tree-lined road about one-fourth mile to the west of the house. Each house is said to have housed two families. The Overseer’s House (circa 1830) is a folk-giant dogtrot, the largest dogtrot in the county and possibly the largest in the state. WPA records make reference to an overseer’s house that could have been this building, as it is located to the west of the house between the original slave-quarter row and the house. Dwight Tew, a previous owner, was offered $30,000 for the dogtrot by a man from New Orleans, who wanted to dismantle it and sell the logs individually for $1,000 each. 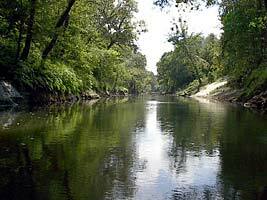 Rent a canoe or bring your own and float the beautiful Chickasawhay River. Put in at Point Bridge on the Chunky River and float south all the way to Shubuta or select your own starting and destination points. Information is available at the Clarke County Chamber of Commerce. (601) 776-5701. Southwest Clarke County on County Road 235. Favorite picnic and resort area of Clarke County in the mid-1900’s. Clear, cold, and beautiful. Now owned by Walk-The-Way Ministries, a non-profit corporation, the lake and grounds are used as a Christian retreat center. (601) 787-3670. East of Lake Waukaway on County Road 230. Beautiful, clear water. Another favorite picnic spot of Clarke Countians in the mid-1900’s. Privately owned. Copyright © 2019 Visit Clarke County. Designed by Mississippi State University Extension Service.